Mix the strawberries and sugar and let sit for 10 minutes. Mix the mascarpone, yogurt and sugar and let sit for 10 minutes. Mix the strawberries into the mascarpone. 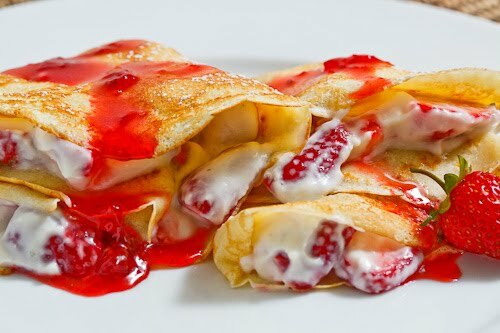 Assemble crepes, top with the strawberry syrup and enjoy. omg, yum! I LOVE mascarpone! oh my, that sounds divine. two of my favorite flavors: mascarpone and strawberry. I like the strawberry syrup recipe! Looks heavenly! Since I eat low carb, I'm going to make the crepes out of egg whites only and omit the sugar. Oh. Oh wow. Yum. I want these. This looks wonderful. Great celebration of fresh strawberries. I like how you often find ways to make your decadent recipes a little bit healthier. The crepes sound delicious. We are on the same wave line. Just posted how how to make Greek spoon sweets with strawberries or apricots. I love a good crepe and this one is some kind of amazing. THat mascarpone filling sounds divine. Yes please I'll have some of those! Fantastic Kevin! That's just a whole lot of deliciousness right there! Those look de-lish, Kevin. I swear I always say the same thing to you. Great photog! Kevin, this is a trump card I was not expecting. I come here for savory dishes and you pull this trick out your hat…..looks so creamy and dreamy!!! You cannot go wrong pairing strawberries and mascarpone. I like the added lightness and tang of yoghurt. The strawberry syrup will be perfect when our strawberries come in….soon. very nice its looking delicious. Yum… I would love some of these right now! You can't beat strawberries and mascarpone! This recipe was amazing. They turned out so well! I omitted the sugar and added a 1/2 teaspoon of vanilla extract to the yogurt/mascarpone mixture and it turned out wonderfully! Thanks for the great recipe! So easy to make… and so delicious! Excellent for breakfast, dessert after a meal and goes very well with the afternoon coffee;^) Thanks for sharing!!! Kevin, once again you have outdone yourself!